Given: Nostalgia can make food more delicious. When you reminisce about that amazing dish you had in New Orleans (and let’s not be mistaken, it was one of the best restaurant meals you’ve ever had), the memory of its taste, plus all of the positive associations of being on vacation, plus the consciousness of the fact that you probably won’t go back there again any time soon, if ever—all of it just comes together to have this crazy synergistic effect on your recollection of how good it was. This memory-enhanced taste perception isn’t unique to dining out on special occasions. It also happens at home when you make things that are inextricably connected to other experiences: the warm fuzzies turn a great recipe into an exceptional one. Homemade biscuits (irresistible!) are my dad insisting that they needed to be cut 1/2″ thick while cooking on one of our rare but cherished “breakfast for dinner” nights. Amelia mud pie (a chocolate ice cream and Kahlua combination in an Oreo cookie crust; not the same as Mississippi mud pie) is summer family birthday get-togethers when my mom was in charge of dessert. Bourbon and ginger ale is decorating the Christmas tree while listening to John Denver’s Rocky Mountain Christmas album. And so on. 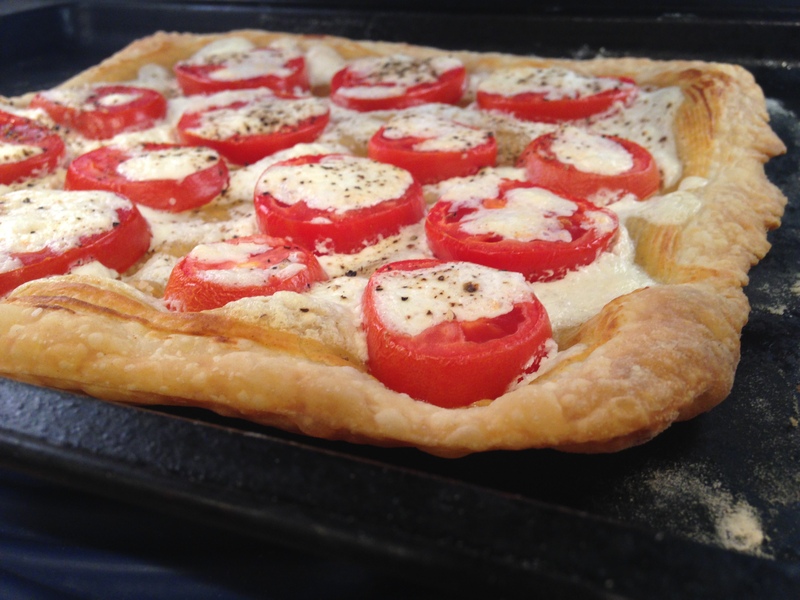 Store-bought puff pastry works perfectly well in this recipe, and the only things that top it are Dijon mustard, sliced tomatoes, salt and pepper, and (if you live in France) a certain type of cream poured straight out of the container—something in between whipping cream and sour cream. Pourable, but not thin. I scrounge together my own version with half-and-half, sour cream, and whipped cream cheese. With the addition of cream cheese, I hesitate to even call this tart “French-style,” but I like its flavor, and it gets the mixture to the right consistency. This was my first attempt at made-from-scratch puff pastry. I got the recipe from a French website and didn’t change much except converting the metric measurements to US standard and clarifying the rolling/rotating process. Out of curiosity, I weighed my completed pastry and compared it to Pepperidge Farm puff pastry. The French website says that it serves 8, but according to the Pepperidge Farm box—which claims that one serving is 41 grams—I had nearly 14 servings on my hands. Ha! For the puff pastry, you essentially make a simple dough of flour, salt, and water, and then fold it around a rectangle of pounded butter. This little package of dough-wrapped butter gets rolled out and tri-folded a grand total of 6 times, et voilà. There is a lot of resting in the fridge (3 1/2 hours total), so it takes a while from start to finish, but it’s not overly complicated. If you’ve got a few hours to spare and some other things to do at home while it’s resting, it doesn’t feel so time-consuming. If, like me, you’re trying to figure out how to avoid wasting all of the garden tomatoes that seem to be ripening at the same time and are eager to use more than the 3 or 4 piddly ones called for in this tart, while your puff pastry dough rests it’s a great time to roast some cherry tomatoes or blanch, peel, and freeze the beefsteaks for later. Note: I’ve found that this recipe works best with plum/Roma tomatoes since they’re less juicy, but it works okay with other tomatoes as well, as long as you seed them first. The puff pastry recipe is adopted, barely, from this recipe for pâté feuilletée from Le Journal des Femmes. 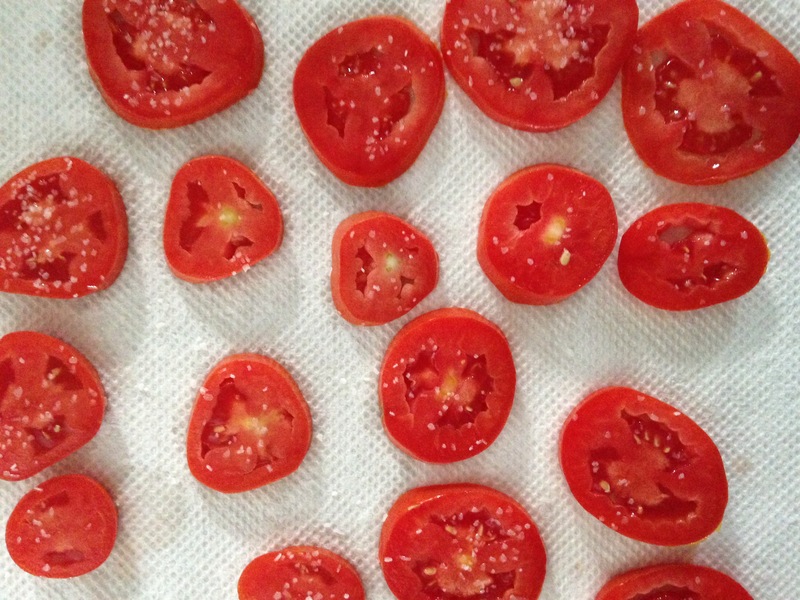 Slice the tomatoes 1/4″ to 1/3″ thick, sprinkle lightly with kosher salt, and place on a double layer of paper towels to drain while you prep everything else. In a small liquid measuring cup, whisk together the sour cream, half-and-half, and whipped cream cheese until relatively smooth. It’s ok if it’s a little lumpy. 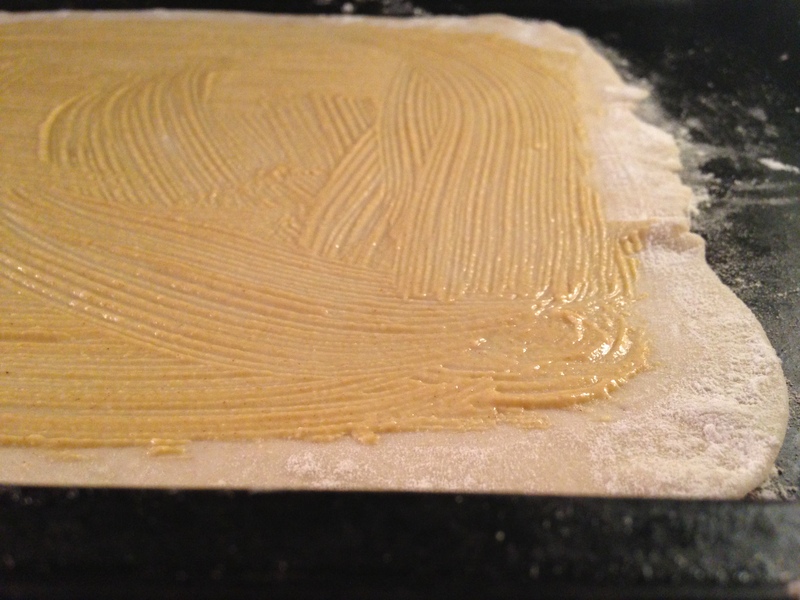 Flour your work surface and roll the puff pastry into a square that’s about 9″ x 9″. Place directly onto a baking sheet. Brush the pastry with the Dijon mustard, leaving a 1/2″ border. Arrange the tomato slices evenly on top and then pour the half-and-half mixture evenly over the tomatoes. It’s not going to completely cover the whole thing; I usually just make a spiral starting in the center. Sprinkle lightly with kosher salt and freshly ground pepper. Bake for 12-15 minutes, or until the crust is deep golden. 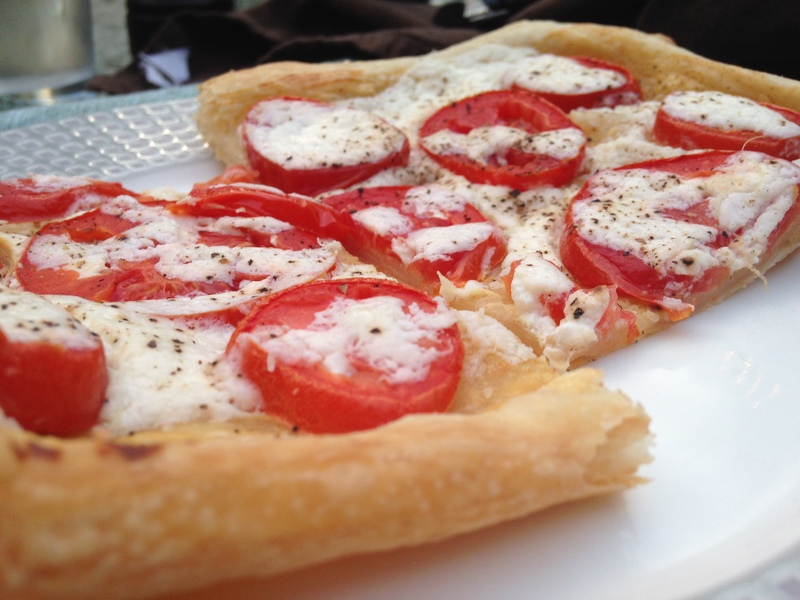 Cut with a pizza cutter and serve immediately. Cut the full stick of butter in half crosswise, wrap all 3 pieces of butter in plastic wrap, and flatten gently with your palm or a rolling pin until it’s more or less in the shape of a rectangle. Refrigerate until ready to use. Whisk together the flour and salt in a large bowl. Make a well in the center and add the 1/2 cup of water. With your fingertips, incorporate the flour bit by bit until you have a ball. If necessary, add a little more water so that the dough comes together. It will be very shaggy; that’s ok. Cut an X in the top, wrap in plastic wrap, and refrigerate for 30 minutes to an hour. Flour your work surface. You can be generous with the flour. Take the chilled ball of dough, unwrap it, and flatten it out with your palm, then use a rolling pin to roll it out into the shape of a cross. Leave the center part a little thicker than the rest. Take your chilled butter out of the fridge, unwrap it, and place it in the center of the cross. Fold over the arms—left, right, top, then bottom—to completely enclose the butter. Add more flour to your work surface as necessary. Roll out the dough away from you, trying not to let any butter escape and making a rectangle 3 times as long as it is wide. Rotate the whole thing a quarter turn (90º) clockwise. Fold into thirds, starting with the left and then the right. Try to line up the sides nicely and keep an even shape. Add more flour if you need, then roll it out away from you again into a rectangle 3 times as long as it is wide, rotate it a quarter turn clockwise, and fold into thirds, starting with the left side and then the right. The first two turns are now complete. Mark the upper right-hand corner by putting a dent in it with your finger, wrap the whole thing in plastic wrap, and refrigerate for at least 30 minutes but ideally an hour. Repeat step 5 two more times, including refrigerating after the last time you fold it. When you take the dough out of the fridge, be sure to start with the mark you made in the upper right-hand corner of the rectangle. The dough is now ready to be used. After folding the pastry for the last time, I cut the whole batch into 4 squares. They kept in the fridge (well-wrapped in plastic wrap) for a few days, and also worked great after being frozen and then defrosted.